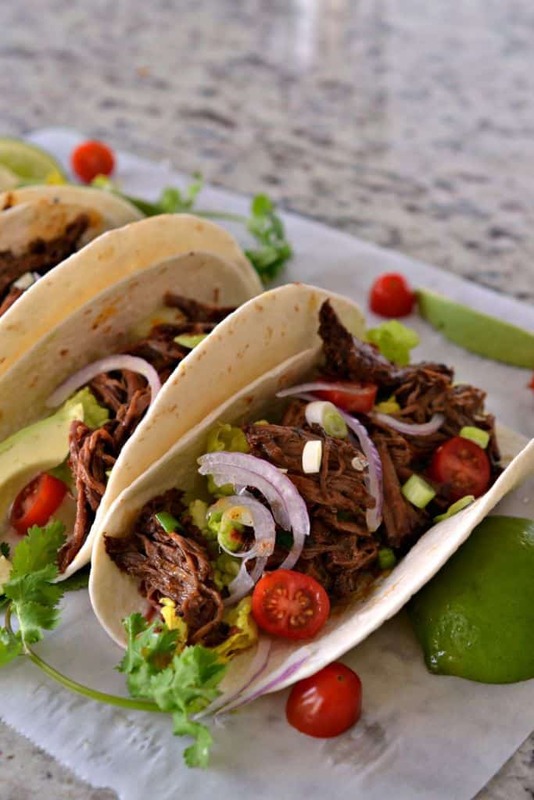 Barbacoa Tacos are filled with tender chuck roast that has been slow cooked in a spicy flavor packed sauce that comes together quickly in a food processor. This traditional Mexican recipe is one of my favorites. Spoon on to corn or flour tortillas and top with vegetables to suit your taste. For a complete meal serve with Fresh Black Bean and Corn Salad (Relish) and Spanish Rice Recipe. There is just something wonderful about having the main part of your meal ready to go at the end of the working day. Not to mention the amazing aroma of slow cooked beef simmering with garlic, peppers, cumin, oregano and lime filling every room of your house. 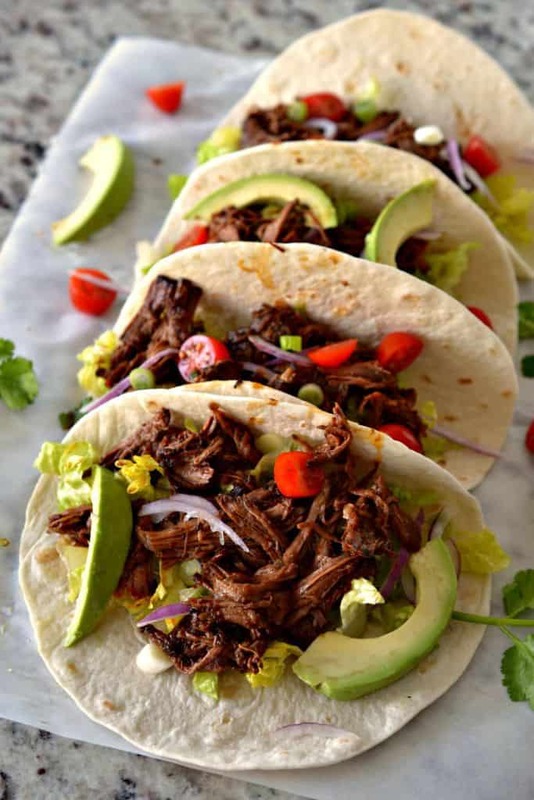 These Barbacoa Tacos are one of my families favorite meals. Leftovers heat up wonderfully and can be used in more tacos, burritos, quesadillas, nachos and chimichangas. 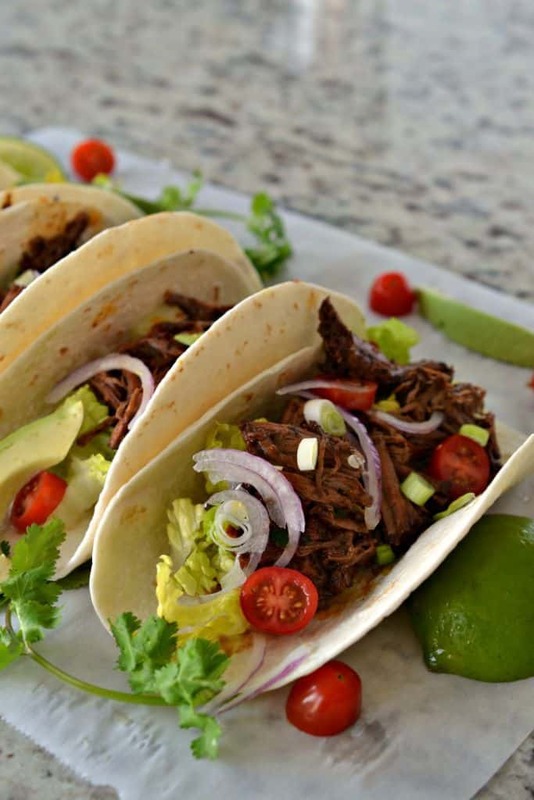 How do you make Barbacoa Tacos? Using a couple of forks shred the pot roast right in the slow cooker removing any fat or gristle. Spoon the meat into soft taco shells and top with lettuce, tomato, red onion and avocado. Serve promptly so the meat is warm and juicy and so the taco shells do not get soggy. You do not have to brown the chuck roast before placing in the crock pot however I think it is worth the effort. The caramelized surface of the meat adds great flavor to the barbacoa recipe. If you do not have a food processor use a blender but mince the garlic and chipotle peppers first. Cook the roast whole and then shred removing unwanted fat and gristle. If you like things spicy add four chipotle peppers. If you like things less spicy add two chipotle peppers. You can cook on high for about six hours or until fork tender. I actually prefer it cooked on low as it seems a tad more tender and more flavorful. Customize your choice of toppings and suit to your own taste. What are chipotle peppers and where do I find them? Chipotle peppers in adobo sauce are dried smoked jalapenos packed in a slightly sweet spicy red sauce. Both the peppers and the sauce pick up flavors and aromas from each other creating a cooks flavor haven. The peppers and sauce can be used in salad dressings, meat marinades, tacos, nachos, burritos, sauces, dips and soups. Chipotle peppers packed in adobo sauce are in the Mexican food section of most grocery stores. They come in a small can. You only need a few of them but you can freeze the rest for future recipes. Freeze flat in a freezer bag then you can break off a piece when you need it. More taco recipes you will love! 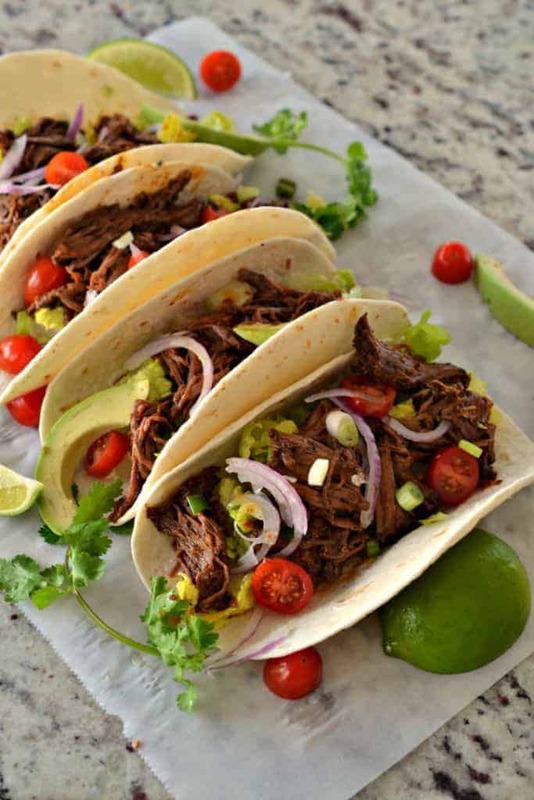 Barbacoa Tacos are filled with tender chuck roast that has been slow cooked in a spicy flavor packed sauce that comes together quickly in a food processor. Heat vegetable oil in large skillet over medium heat. Brown chuck roast on both sides; place in large slow cooker. Add garlic, chipotle peppers, cumin, onion powder, oregano, cloves, salt, pepper, vinegar, beef broth and lime juice to food processor. Pulse several times to blend and pour over chuck roast. Cover the slow cooker; cook on low for 8 hours or high for 5-6 or until fork tender. Using a couple of forks shred chuck roast right in slow cooker removing any fat or gristle. Spoon meat into soft taco shells and top with lettuce, tomato, red onion and avocado. Serve promptly. Subscribe to our mailing list and never miss a recipe! Amazing how many different types of fillings that go into a taco. One can enjoy a different main filling along with the the toppings you’ve suggested. Those are some delicious tacos! They look so amazing. I look forward to making these soon! I already love these tacos! I will have to replace our usual tacos with these when we do Taco Tuesday. Those are some killer tacos! I would literally live off of these! Thank you! You should try them! We love them! 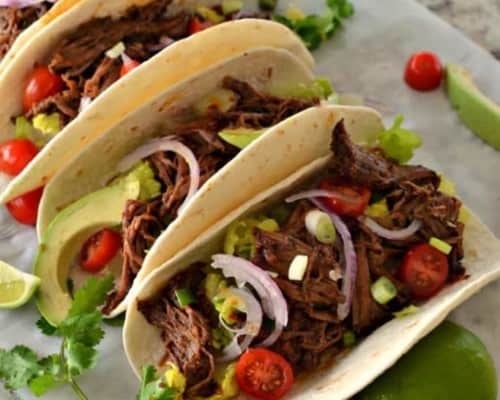 Barbacoa Tacos is one of my favorites. It really brings out the fiesta in any party! It’s perfect for Tuesdays! This will surely be a hit at my house! Looks delicious! I love your recipe! My family loves spicy food so I think I will add more peppers to the crock pot. This would make a really hearty dinner this weekend. Thanks for sharing the recipe! I’m not sure I’ve ever tried barbacoa before. I wonder if my family would enjoy it? i love tacos. yours look so healthy and easy to make! i shall definitely make them this weekend! I love how we can make meat leftovers into a scrumptious looking taco. I guess chicken meat is also good to make. I love this spicy Tacos & would love to polish off a plate. 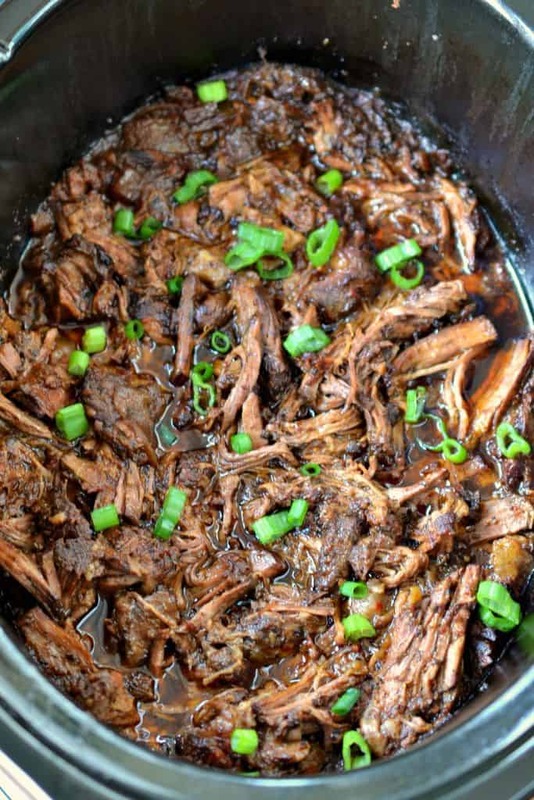 Good recipe & I love slow cooked food. I find them tastier. Love how amazing your recipe looks! Tacos are one of our favorite meals! Welcome to my little niche. I am Beth and this is where you will find all kinds of delectable family friendly recipes that anyone can cook. Can't connect ... Please try again later.